Just bought a book on dorayaki and just tried out one of the recipes. Cooked the redbean paste myself too. Next time need to cook it less sweet. Even though I cut down on a lot of the sugar I still find it too sweet for my liking. Sharing with you my dorayaki. 1. Pour eggs into a mixing bowl. Whisk the eggs until well mix. Add in castor sugar and mixing in the same direction, whisk eggs until the colour is lighter and fluffy. 2. Add in honey and mix well. Then add in baking soda that was mixed with water and mix well. Add in sifted flour and using a spatula mix the flour into the egg mixture. Lastly add in the corn oil and mix well. Do not mix it for too long. 4. Oil a non-stick pan using some paper kitchen towel dub in oil. Heat pan up using low fire. Pour a spoonful of batter into the pan and make into a round shape. Let is cook until you see bubbles forming. Then turn the pancake over and fry for another 5 seconds. 5. Apply sugar syrup onto the hot pancake to prevent it from getting dry and hard. Add filling of your choice and sandwich it with another piece pancake. 1. Soak red bean overnight. Discard water. Refill enough water to cover the red beans. Bring to boil over high heat. When it is boiling, add cold water to bring down the temperature to 50C. Continue to let it boil over high heat until it is really boiling. Turn off fire and sieve red beans and discard water. Fill enough water again and let it boil. Turn down to low heat and continue to boil until red beans can be pressed and is soft. Sieve and discard water. 2. In a pot or wok, add in sugar and maltose and cooked red beans. Use low heat to cook the red beans stirring from below up. Keep stirring until sugar melts and excrete water. Continue to stir and cook until red beans becomes dry. Add in salt and mix well. 3. Leave red bean paste in a shallow pan to let it cool down for later use. your website has been fantastic!!! Do you think u can post the recipe for this delicacy?? Are you able to post your recipe or email to me? I love dorayaki. I will try to translate the recipe and post it up for you. My kids love dorayaki. I will be glad if you could send me the recipe. My email address is ooiceline@gmail.com. Thanks for the sharing the recipe with us. Looking forward to making them this weekend. 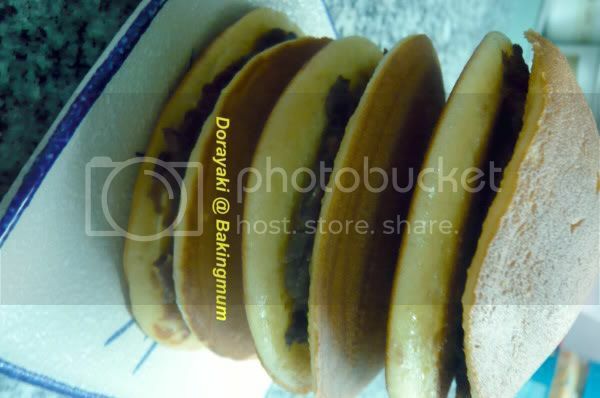 Your Dorayaki looks great and yummy! Thanks for sharing the recipe. Thanks ALOT for sharing the recipe! I ever tried using 5 gram of baking soda for my pan cake. The result was bitter pan cake! Could you enlighten me on the possible cause of it? Try dissolving the baking soda with some water before adding it in to allow easy and even distribution of the soda. Depending on the amount of flour use, you may not need to use all 5g of the soda if it gives a bitter taste. Thanks Lee Lee, for the recipe! "mix 100g of sugar with 100g of sugar and boil until sugar dissolve"
Do you mean mix 100gm of sugar with 100gm of water... or? Dorikaki always makes me so happy when I see it in the supermarket. I've been looking through your posts, you've cooked some of my favourite things ever, the pandan pancakes with the palm sugar and coconut, and mochi, and layered jelly... It makes me really happy to see all this stuff you've made so amazingly, with such attention to detail. Hi Annaisjesus, nice to know you here. Have you tried any of the recipes yet? 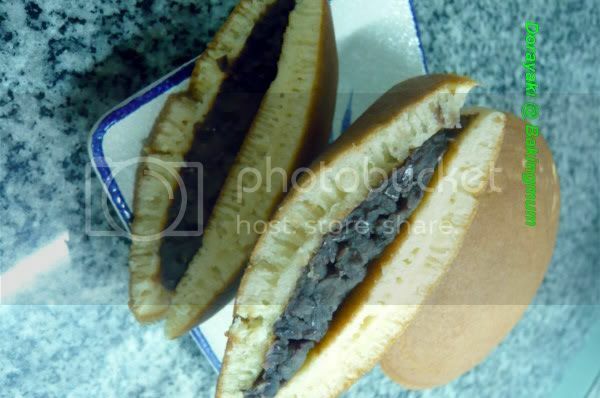 I tried making the Dorayaki last weekend, however it didnt turn out fluffy in texture. I wonder if the liquid quantity be measured in cup/tlbsp rather than gram as it is hard to weigh them. How should the batter texture like in order to get the soft fluffy result? Hi Anonymous, I will try to measure the liquid in tbsp for you. If you want a softer texture, you can actually increase the amount of milk a little. No need to follow exactly as what the recipe states. I will usually add or minus liquid according to the texture of the batter. 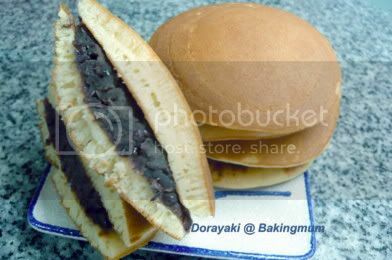 hi, i've tried ur dorayaki recipe. the result turn out great. thanx for sharing. dear bakingmum, ur recipes are great and simple to follow! but plesae tell me what to do now.. i've accidentally "fried" the redbeans a little too long... (after adding sugar, water will be excreted and i'm supposed to stir it till it dries right?) but it "overdried" :( is there a way to make it more moist now? thanks alot for ur help! I'm french ( sorry for my very bad english ... ). I want to make Doriaky this week-end. I have a question, cake flour = self raising flour ? or not ? Thank you so much for your recipes and your answer.